Rome subdues Italy - The near destruction of their city at the hands of the Gauls (see Rome Sacked above left) must have been a wake-up call for the Romans. In the century or so that followed, they did not sit passively and wait for the next invasion. They became the aggressors. They quickly rebuilt their city and strengthened it defenses. Signs of conquest were evident even before Rome was sacked. In 396 B.C., they defeated their chief rival, the Etruscan city of Veii. After the Battle of the Allia (against Brennus), the Romans resumed their struggle with the Etruscans and completely defeated them by 350. In 345, they turned south (the Etruscans were to the north and west) and waged war against the other Latins in Italy. The most fearsome of these were the Samnites. The Romans and the Samnites engaged in three hard fought wars to determine who would rule Central Italy. The primary source for this period is Livy, and he is the only source for the First Samnite War (leading some to question whether or not it actually happened). The First Samnite War was fought between 343 and 341 B.C., and resulted in a negotiated peace with not much being decided in terms of territory. The Second Samnite War was the big one and is often called The Great Samnite War. It lasted from 326 to 304 and ultimately ended in a Roman victory. However, momentum shifted several times in the long conflict and could very easily have turned out differently. The Romans won early battles and the Samnites tried to make peace in 321. But the Romans wanted to exact too harsh of terms and the Samnites rejected them. That same year, the fortunes of the two sides reversed at the Battle of Caudine Forks, resulting in a humiliating defeat for Rome. The Samnites followed that up with a victory in 315 B.C. at Latulae and it looked as though Rome might lose the war. But they turned the tide starting in 311 and won a very important battle at Perusia in 310. From there Rome never looked back and ended the war on favorable terms in 304. But it was not strong enough to achieve total victory. So between 298 and 290 B.C. the third and final Samnite War was fought. Once again, Rome was ultimately victorious and it now dominated all of Central Italy. After that, there was only one power preventing Rome from controlling the entire Italian Peninsula. That was the Greek colony of Tarentum on the southern tip. One might assume that a single Greek colony was no match for the growing power that was becoming Rome; however, Tarentum employed a little help from the Greek mainland. 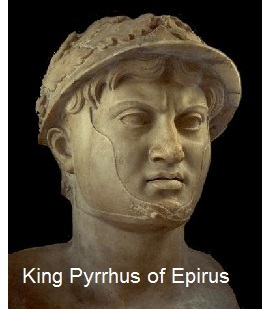 Namely, Pyrrhus of Epirus. What followed was known as the Pyrrhic War, fought from 280 to 275 B.C. This war was famous for coining the phrase "Pyrrhic Victory", which refers to a victory so costly, it might as well be a defeat. This term was born out of the first two battles of the war, Heraclea and Asculum, fought in 280 and 279 respectively. Pyrrhus technically won both, but his losses were so heavy that after Asculum, he was quoted as saying, "Another victory like that will utterly undo me." In 275, he suffered a true defeat at Beneventum and had to withdraw from the war, leaving Tarentum to fall to the Romans. Rome now controlled the Italian Peninsula (except the Po Valley in the North), setting the stage for even bigger things in the near future.